Google has been releasing new interesting updates to its services almost on a monthly basis. For after the new functionalities to Google Drive that were added over the last few months, Google Slides today has witnessed the birth of a new cool feature that allows users to easily adjust and edit images within Slides. With the new feature, users will not only be able to crop and add borders to their Slide images but will also edit and work on them without leaving the Slides. You can now easily adjust the opacity, brightness, and contrast of an image, or change its colour to match the theme of your presentation. 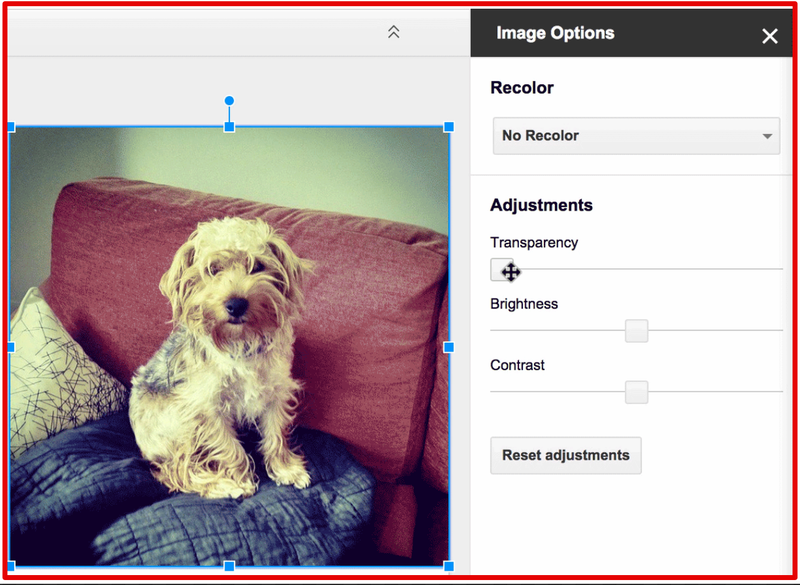 If you want to change the color, brightness, transparency, or contrast for one of your images in a presentation, you can adjust your image options. 1- Open a presentation and select an image. 2- Click the Format menu or right-click the image. Any changes you make will be applied as you edit. You reset an image back to its original form that you've cropped, edited, or otherwise changed in a document or presentation. Open your document or presentation. Click the Reset image button. The edited image will automatically return to the original you added to the file.